"This is a no-nonsense recipe for corn on the cob. Perfect for when you run out of stove or grill space. I freeze the corn on the cob in plastic bags, and remove a single ear of frozen corn in the cold winter months to have the sweet taste of summer corn throughout the year!" Wet a paper towel, and wring out. 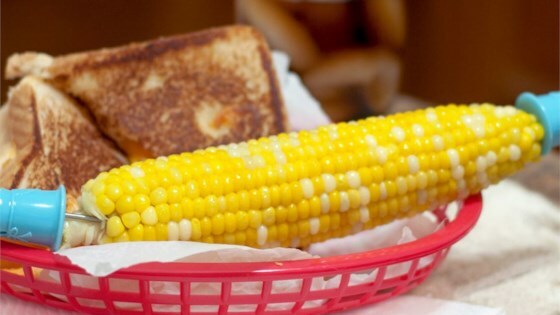 Wrap the ear of corn in the moist towel, and place on a dinner plate. Cook in the microwave for 5 minutes. Carefully remove paper towel, and enjoy! The no-nonsense way to make quick, perfect corn on the cob. I wrap a dry towel around ear of corn and then wet. It's easier then trying to get a limp wet towel around ear.